Fests of every stripe – vintage motorcycles to the air and water show. Kick off your cowboy boots and wiggle your toes in the sand at this beach party, complete with cocktails at the tiki huts, country music and volleyball. Hit the brakes for this antique. American-made motorcycle ride-in show at the Harley-Davidson Museum for pre-1970s bikes and motorcycle field games, including a slow race and plank ride. For four days, Cathedral Square Park looks a little like Paris, complete with French food, music and a 43-foot Eiffel Tower. Thousands of people take to the streets for the Storm the Bastille run, which happens on the evening of July 13. This country music festival in downtown Cudahy with headliners Granger Smith and Parmalee promises to be a rip-roaring good time. Not only is it the world’s largest one-day outdoor fish fry, this festival on Port Washington’s lakefront also offers live music, arts and crafts, a carnival, a classic car show and fireworks. The family-friendly festival, in business for two decades, features four stages of live music and more than 100 vendors selling food and art. The Navy’s Blue Angels return to Milwaukee for the first time since 2010. Beer lovers rejoice! Over 150 brews, plus 40 cask-conditioned ales aka firkins and ciders are available for tasting at this Cathedral Square event (tickets required). 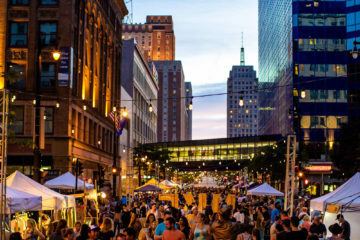 Indulge in the best of Italian culture and cuisine – from bocce and opera to cannoli and pasta – and then rock out to the Gin Blossoms, an unlikely but welcome headliner. Festa is also famous for its exciting fireworks display. Explore the ancient practices of Kirtan and yoga with workshops and classes that encourage reflection, rest and relaxation in a serene, natural space. This touring festival – the largest in the United States – once again makes a stop in the Cream City, with hundreds of punk rock artists converging for a day of music and mayhem. Don your dirndl, sip a hearty brew and shout “Prost!” No matter what your nationality, get in on the fun and celebrate Milwaukee’s rich German heritage. ‘Agenda: July’ appears in the July 2017 issue of Milwaukee Magazine.